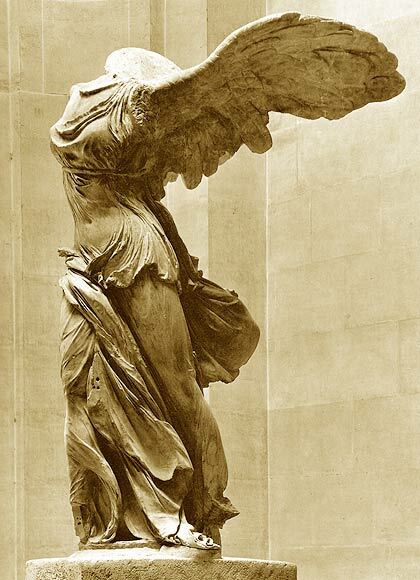 The Nike of Samothrace (also called “Winged Victory”), now at the Louvre, is one of the high points of Western civilization. To behold this sculpture with your own eyes is to be humbled before an antiquity that could attain a vision and an excellence beyond us today. The very idea of “higher” civilization has become unthinkable for us today — or nearly so. It is now considered the height of bad manners to make direct comparisons between the cultural achievements of distinct civilizations, and indeed even to make direct comparisons of relative value within a given civilization. If you maintain that the Iliad is a greater work of art than episodes of Gilligan’s Island, you betray yourself as uncouth and unacquainted with the most recent advances in critical theory and cultural studies. You probably won’t be invited to many dinner parties as it will be assumed that you will say something that will insult and offend others, and this is unacceptable in polite society. Fortunately, I don’t belong to polite society, receive no dinner invitations, and am therefore free to speak my mind without fear or favor (or, for that matter, hunger). I will say, then, directly and unequivocally, that there are higher and lower civilizations, that some civilizations attain the highest reaches of achievement while others do not, and that within our own occidental civilization there are achievements that are worthy of what is best in us. Nothing could do us more good today than to instill the idea of the possibility of higher civilization, which would mean in practical terms that young people might aspire to being a great poet as a calling every bit as legitimate and respected by society as being a doctor, a lawyer, or an engineer. I say “the possibility of higher civilization” because it is obvious that industrialized civilization has not even begun to compete with past civilizations on this level. There is nothing in the contemporary world to compare with the great works of art and literature of ancient and medieval occidental civilization. I might argue that there is some great modern architecture, but I will reserve judgment; the best modern architecture may not yet appear for another few hundred years, and I unfortunately won’t be around to see it, but we can say at least that the works of Oscar Niemeyer and Antoni Gaudí belong to the ages. We may draw the conclusion from the above that we today live in a “lower” civilization, not because other civilizations are industrializing and becoming wealthy (and perhaps will one day leave us behind when it comes to wealth), and not because we are jaded and bored with our affluent lives, but because we have not yet really aspired to producing a higher industrialized civilization. Because, to many in the West, industrialized occidental civilization seems to have reached a plateau of affluence and opulence from which it can only decline, the idea of a higher civilization stands entirely outside the idea of what industrialized civilization is. We need to change this. We need to understand that any civilization can achieve cultural and intellectual excellence. The ever-present drumbeat from the declension lobby from Spengler to the present day, chronicling the decline of the West with a kind of morbid fascination, eager to point out every failing and taking no joy in authentic expressions of vigor and vitality, is at present focused on the oft-mentioned “Rise of China” (which I wrote about yesterday in China Envy). I find it interesting in the debate now current in the media — and not without its contributions by eminent intellectuals like Francis Fukuyama, Joseph Nye, and Gideon Rachman (well, the latter is more a journalist than an intellectual, but he is an exception among journalists) — the focus is purely on material measures of progress and competition. The idea that civilizations might be compared on the basis of their higher functions and achievements is not only alien or odd, it is non-existent. The idea of higher civilization ought to be rehabilitated, because in a world that is approximating a fully industrialized condition, and which one day (unless the radical declensionists get their way and civilization collapses altogether) will fulfill that condition, there will be few meaningful material measures of progress and success other than purely technical, quantifiable, and incremental measures specific to the nature of industrialized society and blind to the cultural achievements of the civilizations that gave birth to industrialization. These considerations bring us back around to Fukuyama’s original thesis in his first “The End of History” essay, later expanded into the book The End of the History and the Last Man, where he contends that, once the institutions of market democracies are adopted universally, there will be no great ideological conflicts among post-historical nation-states, only incremental improvements in dull matters like quality of life. It has become commonplace to ridicule Fukuyama’s influential essay, and Fukuyama has himself distanced himself from it (what intelligent person would not distance themselves from an opinion piece written more than twenty years ago? ), but this thesis still has some value in my eyes. In fact, we are seeing the value of Fukuyama’s original thesis played out in the media every day. We all know that China’s “socialism with Chinese characteristics” is a euphemism for unbridled capitalism, and while China has not “Westernized” nor has it consciously sought to imitate the institutions of Western market democracy, this is utterly beside the point. Industrialization has a logic of its own, independent of culture. Industrialization happened first in Western civilization, and so become identified with the West. Maybe sometime in the future industrialization will be identified with China. It doesn’t really matter either way. But what does matter is that the structural changes forced upon a society by the institutions of industrialization create societies in the image of industrialization, regardless of tradition. Tradition becomes reduced to the heirlooms of a previous way of life that can be displayed on a bookshelf or in a glass cabinet: the way of life itself is gone, and cannot be recovered; we can only remind ourselves of it with token mementos. Because societies organized on industrial principles resemble each other more than they resemble the traditional civilization of which they are the descendant, they have common measures of progress and success. We are all familiar with figures like per capita GDP, quality of life, PPP, and consumer spending, and these are the ways that industrialized civilizations compare themselves to each other. There are also measures that are a little less quantifiable, like major infrastructure development. What an industrial infrastructure serves can be quantified (the number of bridges built, the length of paved roads, megawatts of electrical power generated, the number of degrees granted by universities) but the monumental aspects of such projects are more difficult to quantify. If we rehabilitate the idea of higher civilization, if we can find a formulation to honor the high culture achievements of a civilization that is not damningly ethnocentric, then we would have a way to compare and contrast civilizations independently of the material measures of progress and success. This means making judgments based on unquantifiable factors, and even the indulging the contemporary heresy of arranging a hierarchy of civilizations with some near the top and others near the bottom. Some would find this exercise painful; more would find it arrogant; others would find it simply silly. But, by the same token, the standards that other civilizations use to judge Western civilization, might well seem to us painful, arrogant, or silly. Just as important, and, I think, ultimately more important, in the idea of higher civilization and a ranking of civilizations according to the qualitative contribution to human experience and world history, is that the idea of higher civilization gives us something to which we can aspire. It is a common complaint of the declensionists, and an implicit theme of much contemporary comment, that life in industrialized civilization makes us indolent and indulgent, giving us nothing to which we can aspire. That may be true of industrialized civilization in its current form, but it need not remain true. Civilization, in whatever form, is ours to do with as we please, and if any industrialized civilization can take control of its own destiny and inspire its people not merely to build more bridges or hand out more degrees, but to write a great poem or paint a beautiful picture, then we will be on the way to a civilization that is worthy of our highest aspirations and all that is best in us. Remember Fukuyama’s subtitle was and the Last Man. As Nietzsche asserts, that “Last Man” is as ineradicable as a flea. What is “happiness?” Does the Last Man know? The problem at its core is the limitation of our understanding of the unitary nature of the physical medium itself. We have lost our sense of unitary analogy. That physics = spirit = magic = alchemy = art = music = philosophy = love = thought = science drove the very high civilizations. It is the Tower of Babel moment we need to address. See Joseph P. Farrell.